I came across this recipe on Epicurious while looking for an easy and quick chicken dinner. This was tasty and very easy to put together. The only thing I would do differently the next time I make this is dredge the chicken in some flour before putting it into the pan. I didn’t have basil, as the recipe called for and used whatever I had in the fridge. 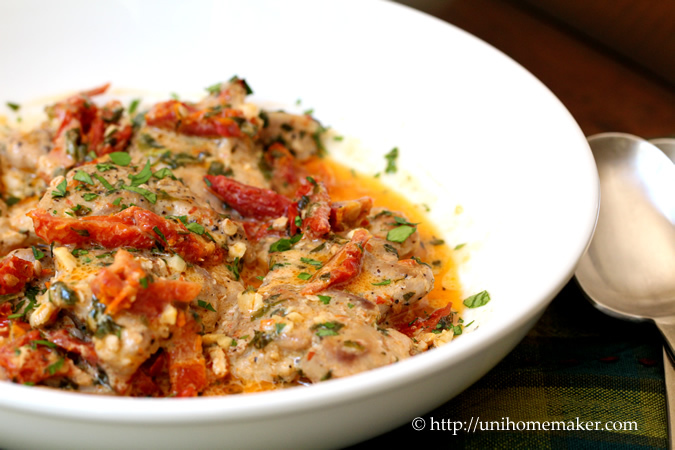 The mix of parsley, mint and tarragon paired nicely with the chicken and sun-dried tomatoes. If you’re looking for an easy chicken dinner, look no further! Season chicken thighs with salt and pepper. In a large sauté pan over medium high heat, add oil and chicken to the skillet and cook until brown, about 3-4 minutes per side. Transfer chicken to a plate; set aside. Add garlic and stir for 30 seconds, be sure not to burn the garlic. Add white wine, cream and tomatoes. Stir to combine and bring the mixture to a boil. Slide chicken back into the skillet and cover. Reduce the heat to medium low and simmer until chicken is just cooked through, about 3-4 minutes. Transfer chicken to a serving plate. Add parsley, mint and tarragon to the sauce. Increase the heat and boil until sauce thickens enough to coat the spoon, about 1-2 minutes. Check the sauce for seasoning then spoon over the chicken. Sprinkle extra chopped parsley on top and serve. Looks so hearty and delicious! I love the way tarragon tastes with chicken. Does look wonderful. I’m always looking for chicken recipes and I just found another one. 🙂 I’ll try it. Thanks! That looks so delicious, I just have to make it, maybe tonight! Anne, I wanted to let you know I made this for the family and it was a big hit! Really awesome recipe and raves all around! Thanks for sharing, it’s already been requested to make again! Oh my goodness, Anne, this looks amazing!! Pinning right now to try! On my to-make list! This looks totally yum! What a gourmet and delicious sounding (and looking) dish. YUM. I am always looking for quick and easy chicken dinners- this one looks wonderful! 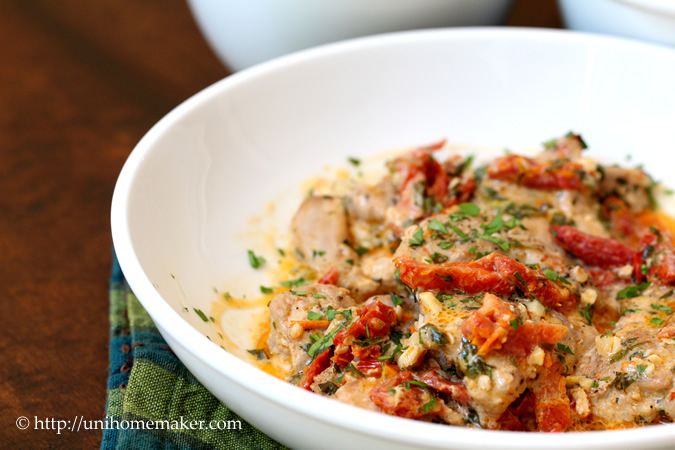 I love tarragon with chicken, and sun dried tomatoes too. Looks so bright and cheerful! I am always looking for non boring chicken dishes and this recipe looks like it falls into that category. This is my kind of dinner! A little creamy and with the sun-dried tomatoes? Which I happen to have a jar of right now… sounds delicious! This is such a cozy, comforting looking meal, Anne! I love sun dried tomatoes this time of year. That means I can still enjoy my favorite veg (fruit?) all year round. What a lovely dish! Sun dried tomatoes are my love ❤ this rocks! Mmm…this looks so good with that creamy sauce! I’ve learn to appreciate sun dried tomatoes so I’m all for this whole thing! Absolutely fantastic looking chicken dish, Anne. Thanks for the tips and putting this together, it looks really good!! 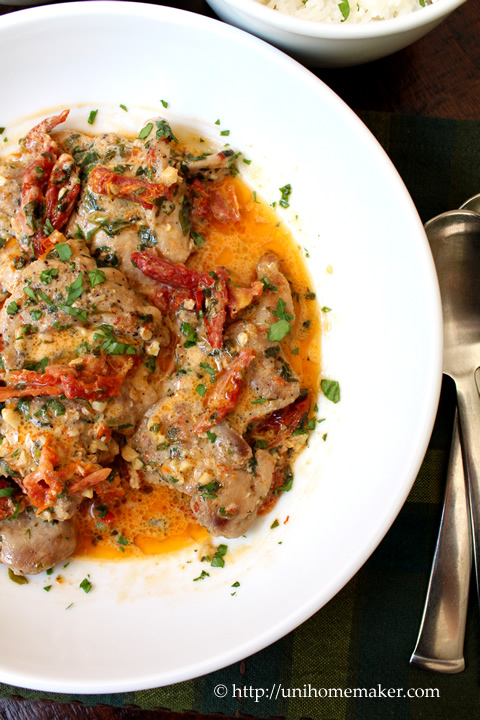 The sun-dried tomatoes really came through in this dish. I love how you can pretty much use chicken in anything and come up with a million different meals. The cream in here is subtle, but I love that. It’s just enough to give the sauce some body, but it’s not too much where you feel like it’s unhealthy or heavy. I want to eat this again! Oh, how I adore sun-dried tomatoes! This is a must make as soon as possible chicken dish. Cannot wait to try it and I love how you made it flavorful and creamy with the white wine and cream. Yes, please! This looks SO good! I have a ton of success with Epicurious recipes, so I’m not surprised this is another good recipe. YUM! Looks absolutely wonderful! Making me hungry now! Gosh, this looks like a nice, flavorful dish that’s pretty easy to make. What’s not to like? Nothing, which means I need to make this! Thanks so much. What an amazing weeknight dinner recipe. I love finding those great new recipes on Epicurious – I can get lost in there. Must try this in the dinner rotation! Mouthwatering! I will need some rice to soak up that sauce. Yum… Trying this soon! wow, it looks like a michelin star chef dish…..
lucky me saving my homemade sun dried cherry tomato for such this recipe…. This does look so good! I love how intense sun dried tomatoes are. I mean, the fresh ones are spectacular but sun dried ones just give such a kick. 🙂 I’m pinning this for later! I like easy dinners for the busy weeknights. This looks oh so amazing, Anne! I really have to try this soon. I have a pack of frozen chicken thighs so I’m already part way to having the needed ingredients. Pinned! All that is missing is a nice glass of chardonnay. Beautiful dish Anne! This creamy chicken meal looks like the perfect dinner dish! Sun dried tomatoes are a strategic ingredient, making any sauce rich and decadent. Love your yummy pics! Love this recipe, have oven roasted tomatoes in the freezer, I think they would make good substitute for the sun-dried ones. I’m always looking for easy chicken dinners, Anne, and this one looks fantastic! Anything with sundried tomatoes and cream makes me hungry! This looks just lovely. 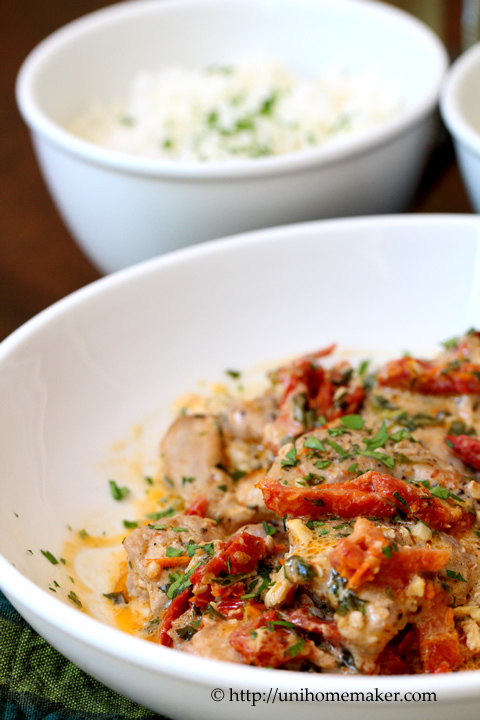 A great new chicken dish to add to the rotation. Oh my, I love this! It is definitely my kind of meal – will be trying this in the near future – pinned! Wow does this look wonderful. I can’t wait to try it. I’ve pinned it…maybe next week I can get to it! OMG Anne! That looks fabulously divine!!! Really! This looks absolutely marvelous. I can almost taste it! This sounds/looks so so good! I think we must have very similar taste buds because every recipe you post is totally right up my alley 🙂 I’ll definitely be making this for dinner soon! !